The Indonesian American community is small; however, Indonesian gamelan (percussion orchestra) ensembles have gained an outsized presence within American academic music programs in the past six decades since the first two academic gamelan ensembles were founded at the University of California-Los Angeles. Based on nearly a decade of research within American gamelan communities, this paper examines how gamelan communities have approached the task of representation. As Carnatic music’s education system shifts and develops, performance practices and live venues reflect the impact of this music’s migration to the U.S. 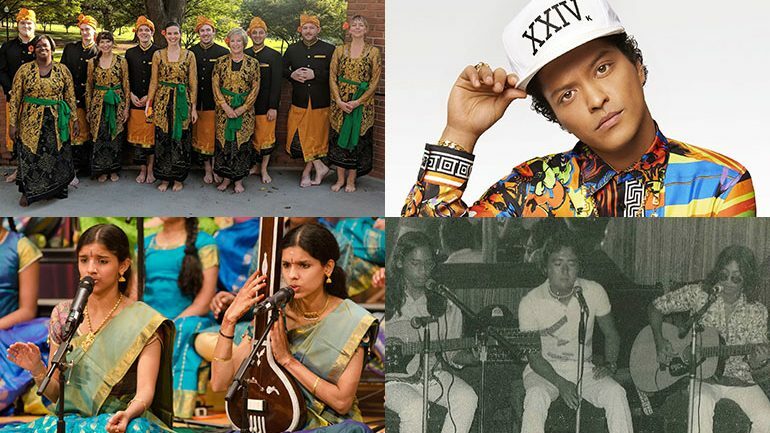 In this paper, drawing on ethnographic observations of the 2018 Cleveland Thyagaraja Festival and interviews with organizers and participants, I demonstrate that the performance spaces and community accessibility provided through the festival’s education program reveal the globalization of this tradition and contribute to the re-formation of South Asian identity in American education and music performance contexts. This paper examines the musical practices of Chinese seniors (age 60 and over) in weekly singing classes in Chinatown, Philadelphia. These seniors are a special group within the Chinese diasporic community, as many have lived under Mao’s regime and through the reform era. In turn, they have experienced periods where music was used as an educational tool, as a political weapon, and as products for consumption. Given their varied experiences with music, what does music making look like for them in Philadelphia? From the annexation of Hawaii, Guam and the Philippines to the Asian theater in World War II and subsequent Japanese occupation, and from the Korean War to the Vietnam war and the illegal, covert bombings of Cambodia and Laos, U.S. military policy has—since the late 19th century—changed the fates of Asians along the Pacific Rim, and led many to immigrate to North America. This panel explores how U.S. militarism has affected the creation, dissemination and reception of the music of Asian America. No stranger to charges of cultural appropriation, Filipino Puerto Rican American pop star, Bruno Mars is a key subject in debates on blackness and the mainstream. This paper examines Mars’ racialized reception to ask how the Asian American performing body mediates perceptions of race, place, and the political in U.S. popular music. Specifically, I examine Mars’ training and labor as an Elvis impersonator to trace the contours of the militourism entertainment complex in the Philippines, Puerto Rico and Hawaii and to situate his framing as an unthreatening and apolitical multicultural figure in U.S. popular music within deflected processes of U.S. militarism and the tourism industry’s coeval logics of imperial amnesia. “American Peril: Imagining the Foreign Threat” displays more than 40 original prints of anti-Asian propaganda in the United States from the 1870s to the present day. It is in four sections: (1) Chinese Exclusion and Propaganda Supporting the Annexation of the Philippines, (2) Anti- Japanese Propaganda during WWII, (3) Japan Bashing in the 1970s and 1980s, and (4) Anti-Muslim and Post-9/11 Islamophobia. This exhibit and the associated programming aim to educate the public about the complex history of Anti-Asian racism in the US and encourage audiences to think critically about contemporary political rhetoric. By placing prints from close to a 150-year span together, we hope to show both continuities and changes in U.S. racial politics. The audience will recognize how the exclusion logic, which was first applied to people of Chinese descent, came to be employed for people of Japanese descent in the early-mid 20th century and people of Middle Eastern origins in the late 20th and early 21st centuries. They will also realize how malleable the concept of an “inassimilable alien” is, as they will see the term applied to everything from “coolies” to “model minorities” and from Buddhists to Muslims.